Reduce swelling without using poultice or liniment. 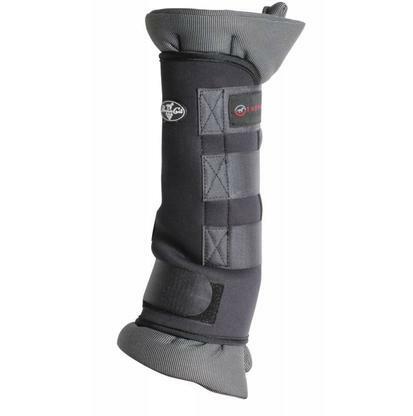 The Welltex fabric infused with ceramic powder created infrared heat that speeds recovery and relieves inflamed ligaments, joints, and tendons. The therapeutic quick wraps are easy to put on and take off. They can be left on overnight or used for shorter periods after strenuous activities. 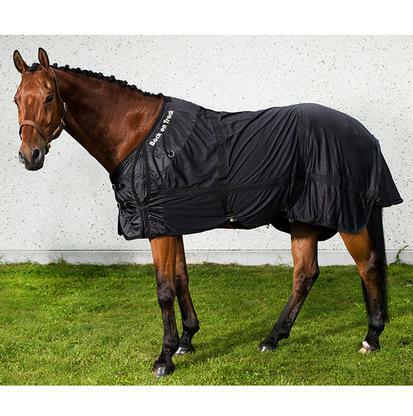 Therapeutic mesh sheet that combats inflammation using far infrared thermal warmth that won’t overheat your horse. Airy mesh covers a layer of Welltex fabric, which is made of thin ceramics. 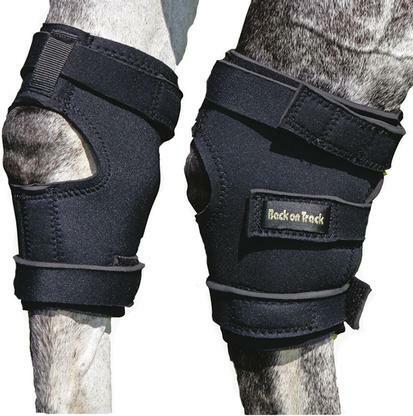 This offers your horse full protection and increased blood circulation. This keeps the muscles looser, less inflamed, and makes them more likely to recover. 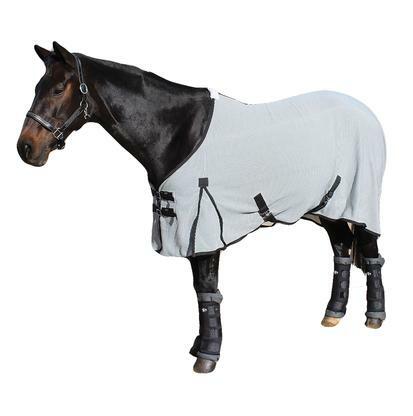 This mesh sheet has double buckles, bell surcingles, tail flap, and leg straps. It is also washable. The therapeutic mesh sheet can be used alone or as a liner. 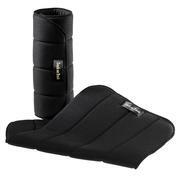 Ceramic infused hock boots with a neoprene exterior reflect body heat and creates soothing far infrared thermal warmth. Helps heal and relieve injuries to the joints, tendons, and muscles. This boot leaves the hock joint uncovered while covering the hock. 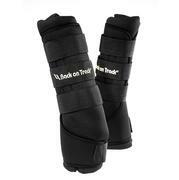 This hock boot is fully adjustable using Velcro straps and has a 3 ¼ inch diameter hole. Can be used for shipping, overnight treatment, or after strenuous activity. The Magnetic Blanket has over 80 strategically placed magnets. Each magnet has been sewn into place for maximum healing benefits. The light weight mesh fabric is perfect for year round use; a fleece patch over the withers prevents the mane from being rubbed out. The blanket is held securely in place with a nylon surcingle and two elastic leg straps. 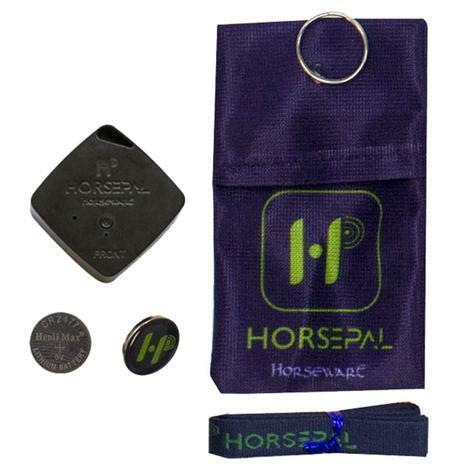 The Horsepal Sensor and App allows you to monitor your horse's humidity and temperature. Horsepal is a revolutionary piece of technology to improve your horse’s comfort and health. This revolutionary new application of technology tracks the surface body temperature and weather patterns so your horse is never too cold or too hot. 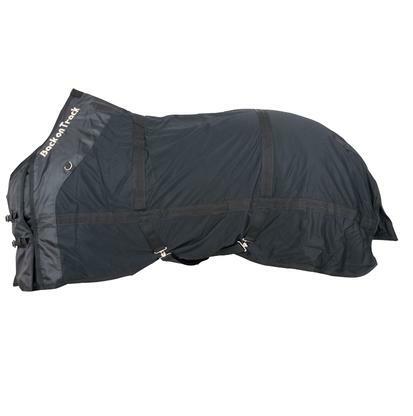 The Horseware Rambo Ionic stable sheet is ideal for use before exercise and prepares muscles for work. It may also be used after exercise to help reduce any lactic acid build up caused by exercise. 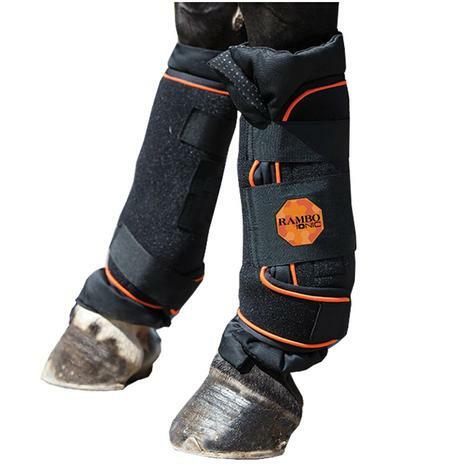 Horseware Rambo Ionic Stable Boots are great to use while your horse is travelling, or in the stable. These boots have removable liners to promote circulation using new Ionic technology, with Neoprene outer and a removable insert made with polycotton fabric. 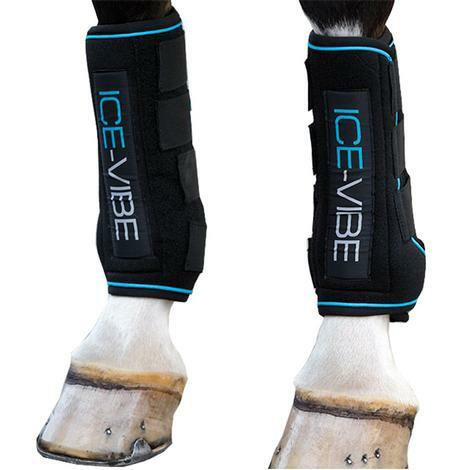 Horseware Ireland Ice-Vibe tendon boots are a portable massage boot with hot/cold inserts to encourage hot or cold circulation. These boots can be used before or after exercise or during rehabilitation. 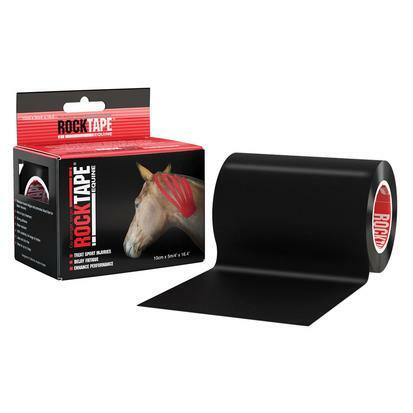 Rock Tape Equine Kinesiology Tape 4"
Decompresses the area of application which reduces swelling, edema, and lifts skin away from muscle and fascia. This signals the central nervous system through the skin’s nerves. Feedback from this signal produces feedback which lessens pain and cue form. Muscle tone is normalized, functionality is supported, and full range is supported during rehabilitation. Ideal support for the rehabilitation of muscle strain, muscle strain, muscle tears, stiffness, tendonitis, desmitis, and tendonopathy. This product also supports myofascial release, acupuncture, massage, and other body work. Can also be used to prevent movement dysfunction. 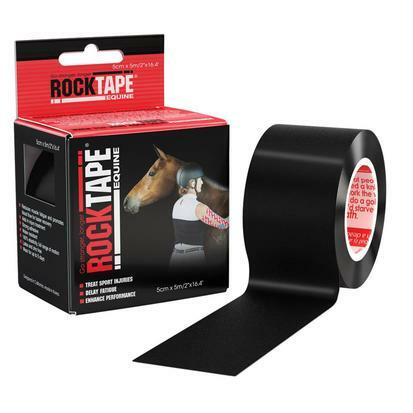 Rock Tape Equine Kinesiology Tape 2"
Decompresses the area of application which reduces swelling, edema, and lifts skin away from muscle and fascia. This signals the central nervous system through the skin’s nerves. Feedback from this signal produces feedback which lessens pain and cue form. Muscle tone is normalized, functionality is supported, and full range is supported during rehabilitation. Ideal support for the rehabilitation of muscle strain, muscle tears, stiffness, tendonitis, desmitis, and tendonopathy. This product also supports myofascial release, acupuncture, massage, and other body work. Can also be used to prevent movement dysfunction. Prevent injury and speed recovery with this drug free therapy system. This product is engineered to increase circulation, reduce inflammation, and ease pain with long wave infrared heat radiation. Theramic combo wraps are built from reflective ceramic fibers that utilize your horse’s own body heat to create the healing long infrared waves. Hook and loop closures make application quick and simple, while the removable and washable liners keeps the wraps fresh and clean. One product that gives you the resources to prepare, treat, and repair. Theramic combo wraps features ceramic fiber yarn that creates long wave infrared radiation created by your horse’s own body heat. This increases circulation helps ease pain and reduce inflammation. This helps prepare your horse for rigorous activity. It is also an indispensable tool for accelerating recovery. These wraps are durable but easy to wear. The liners are removable and washable. The loop and hook closure allows for proper fit and flexibility. Professional’s Choice Theramic Sheet is a drug free treatment engineered to help reduce injury and inflammation. Ceramic fibers increases blood flow, speeds recovery, and provides pain relief. This relief is achieved thru long wave infrared heat radiation. Your horse’s own body heat is reflected and altered by the ceramic fibers. Long wave infrared heat radiation is absorbed easily and provides maximum therapeutic effects. Long wave infrared heat radiation is easily absorbable and provides multiple therapeutic effects. The new Theramic sheet produces these waves by reflecting and altering body heat with ceramic fibers. This therapy provides pain relief, reduced inflammation, and increased circulation. This drug free system can be used pre or post work out and for rehabilitative purposes. It is ideal for chronic conditions because of the lack of side effects. Drug free relief from pain, injury, and inflammation. 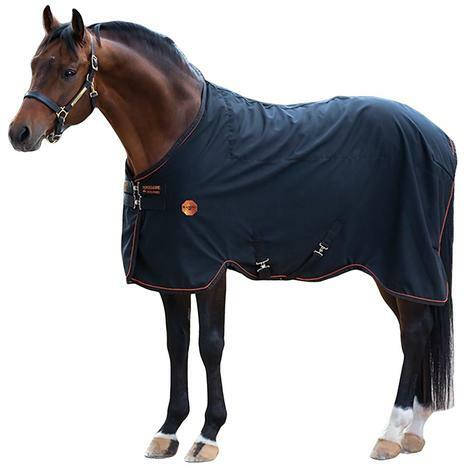 The Theramic sheet is built from engineered ceramic fibers that transform body heat into long wave infrared heat radiation, which is redirected back to your horse. These waves are easily absorbed and immediately begin increasing circulation, easing pain, and reducing inflammation. 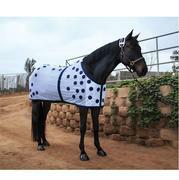 Back on Track wraps use of the art fabric which contains polyester thread embedded with a fine ceramic powder to reflect the horse's own body-warmth. 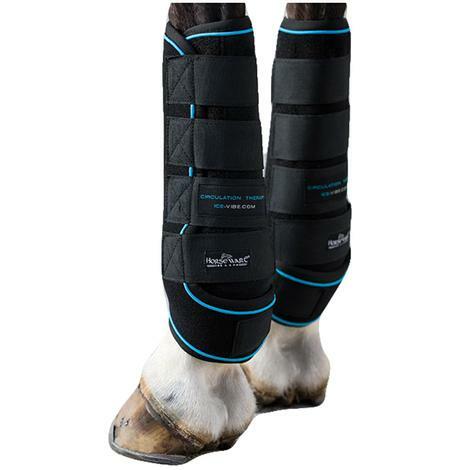 These wraps can help reduce the swelling in the horse's legs in just a few days.